.Reading this in your email? For easier reading – Click here. 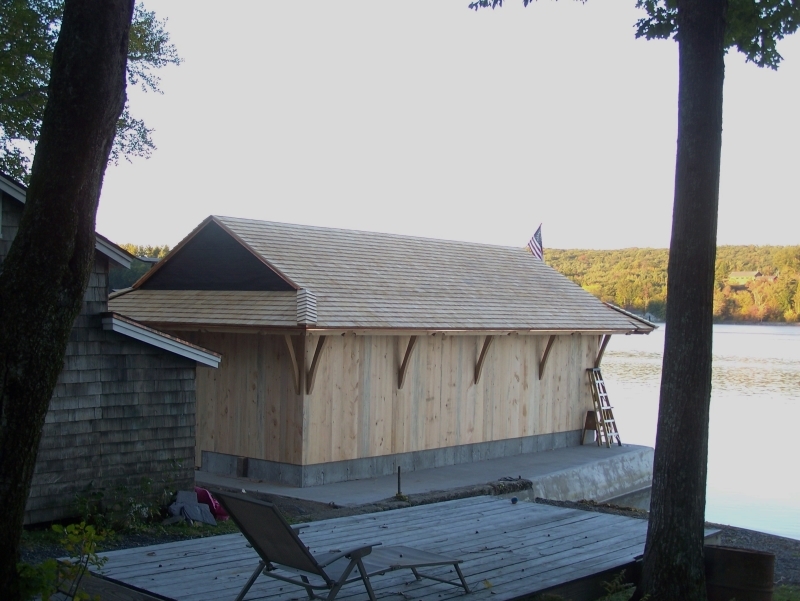 We built the new timber frame structure on beautiful Lake Bomoseen – literally on and over the lake. 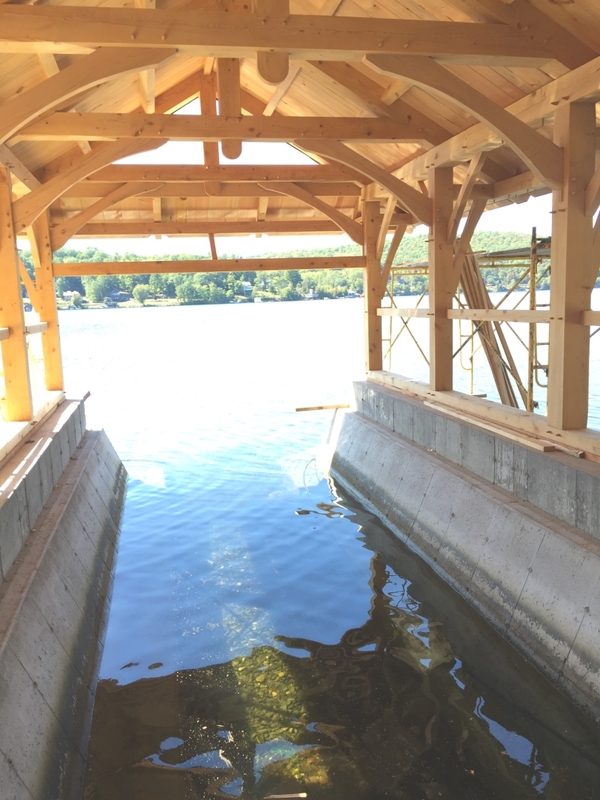 The goal was to build a post and beam structure over a boat mooring, allowing a boat to come inside, be lifted out of the water and stored for the winter. One particularly exciting aspect of this project is that the hemlock and oak were cut from the property using a portable saw mill. 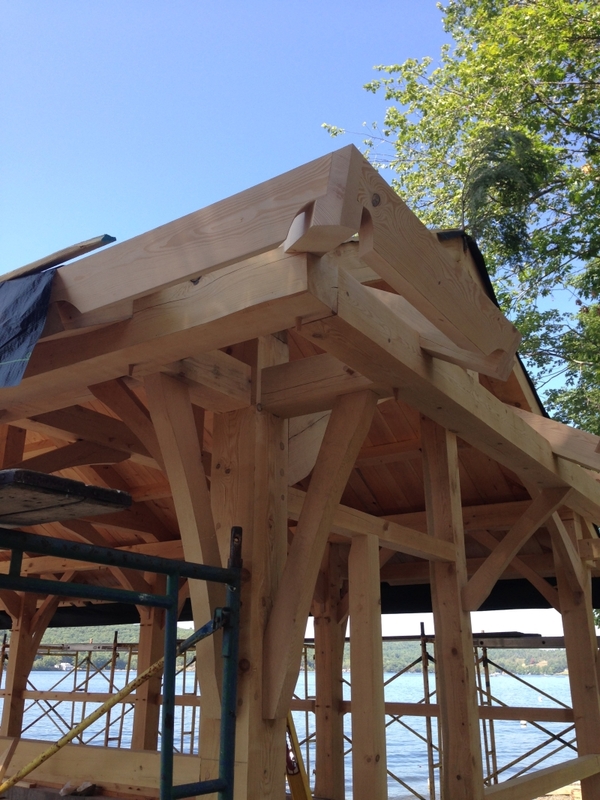 Only on a few rare occasions has Green Mountain Timber Frames been able to cut a new timber frame using materials from the land where the structure will be built­. Luckily for us, this was one of them! 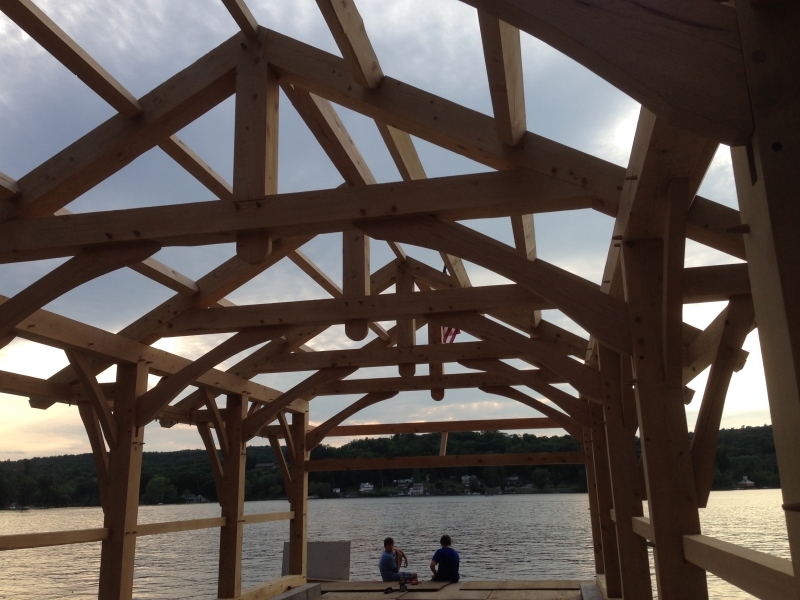 When it came to designing the boat house frame, our very own Luke Larson worked closely with the property owners. It was a great pleasure to work together to create a design that fit the goals and desires of the owners and also worked structurally. One of those goals was to have an attractive shed roof across the gables. We decided to accomplish this with a secondary top plate, which we started calling an “outrigger,” that turns the corner and wraps across the gable ends. 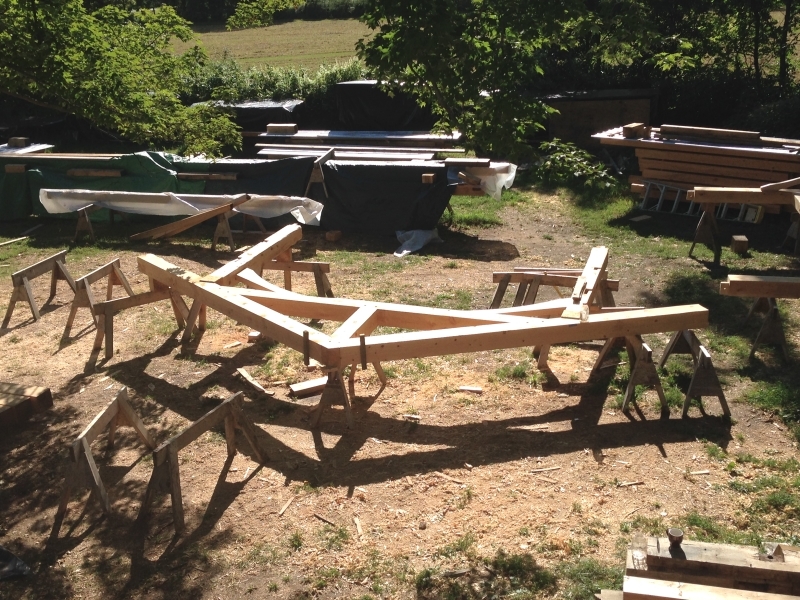 The various dimensions of this frame were each built on saw horses in our yard, so that we could check all the math, angles and joinery as we went. 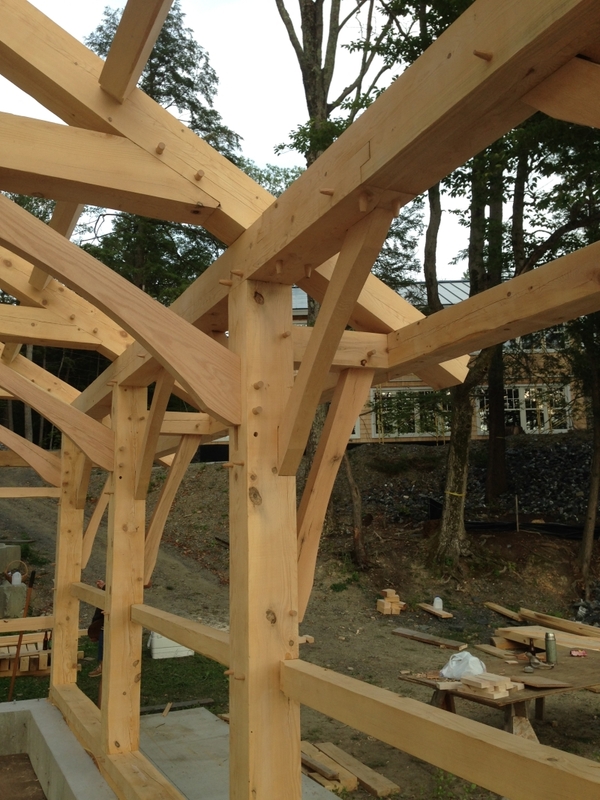 We used king post trusses to frame the bents and curved oak braces throughout the frame. Most of the purlins in the frame were hemlock from the property, but we needed two pick points in the ceiling that would be strong enough to lift a 4,000 pound boat. 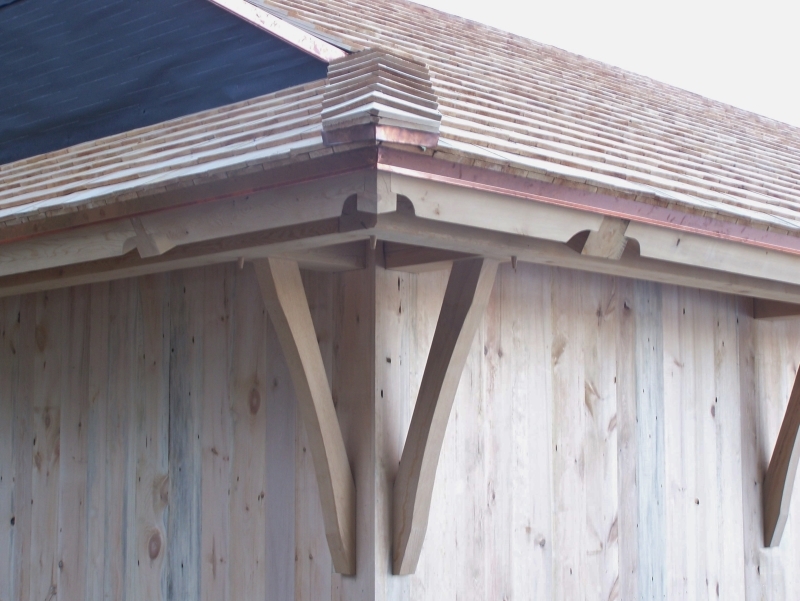 Heavy oak purlins were installed at two places which are rated for well over 2,000 pound point loads each. The location of the timber frame presented challenges in getting it erected. Since the lay of the land was such that a crane or lull was not feasible, we put it up the old fashioned way – by hand. Dan went out in his kayak to take this picture of the flag being raised. Here is a what the rafter trusses look like with the roof boards and wall sheathing applied. These were also harvested on the property. 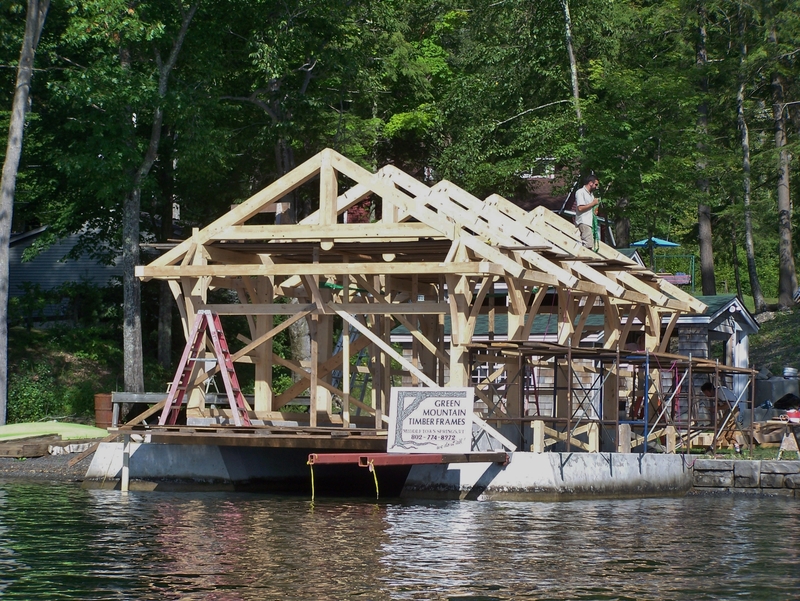 Soon there will be a walkway around the inside edges of the boathouse. We were especially happy with how the hip corners and eve purlins turned out visually. Next, the structure will receive beautiful salvaged windows, carefully restored, and a layer of cedar shingles on the walls. There will also be triangular windows in the peak. Take a look! 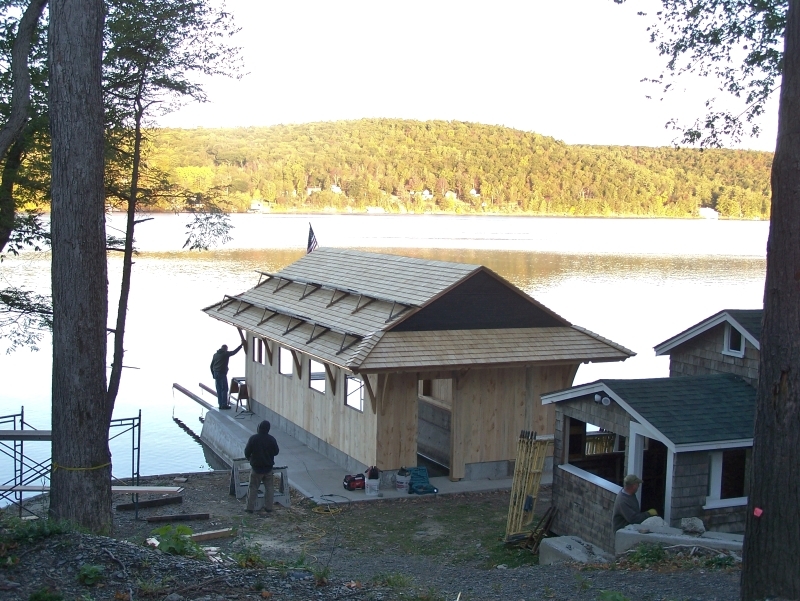 Interested in your very own timber frame boat house? 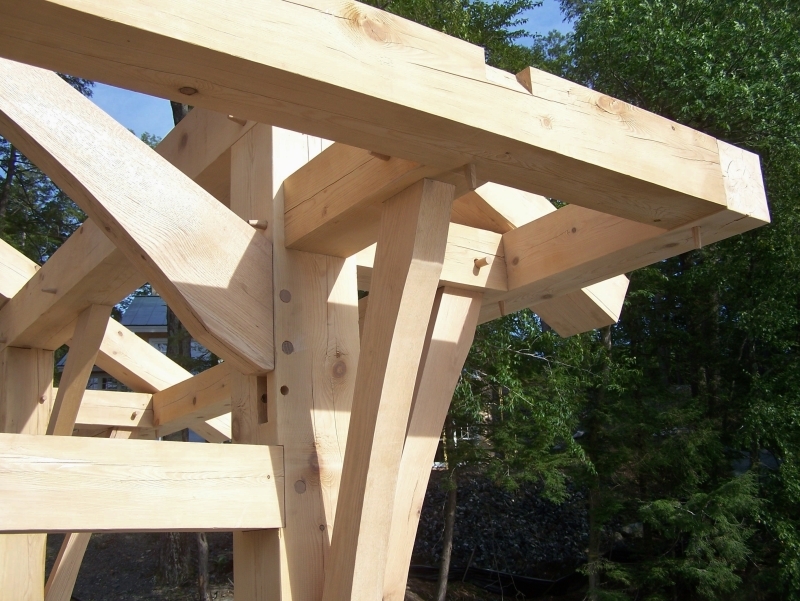 Have another timber frame project in mind? 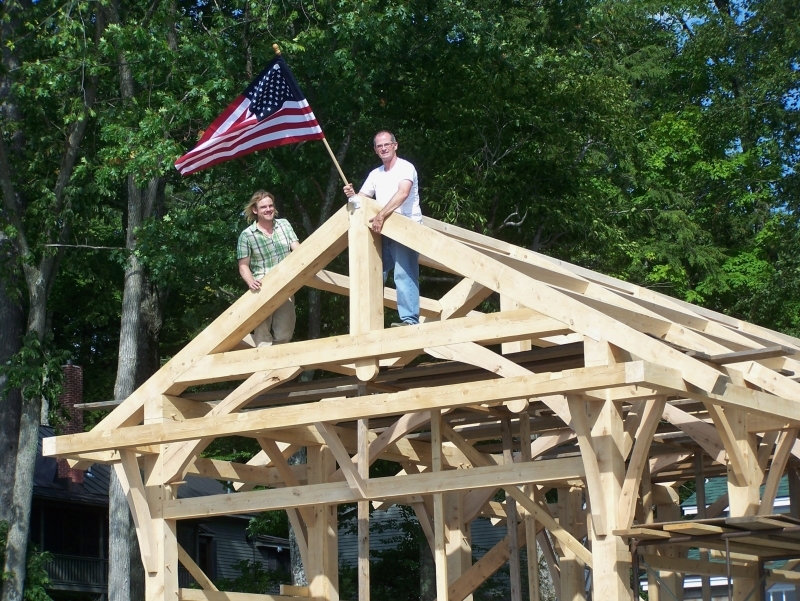 Green Mountain Timber Frames specializes in historic timber frames and restoration projects, but we also erect new timber frames. Contact us with any questions! 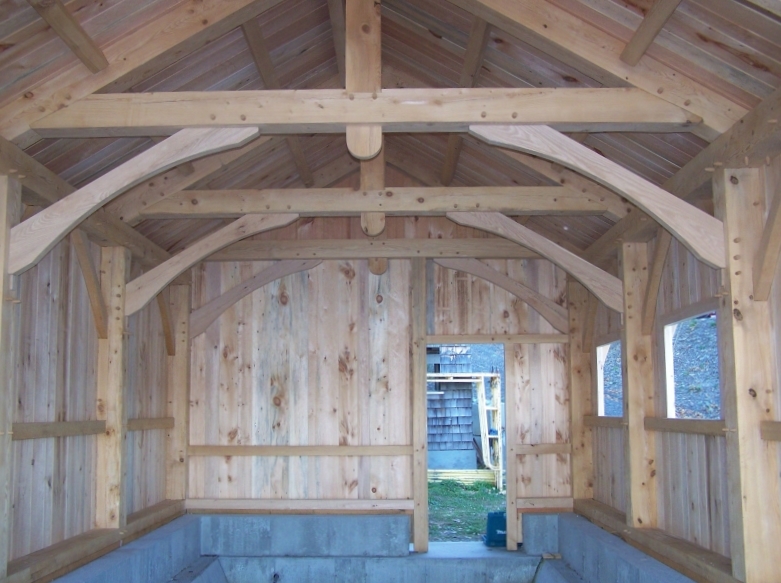 Email Luke@GreenMountainTimberFrames.com or call 802.774.8972. 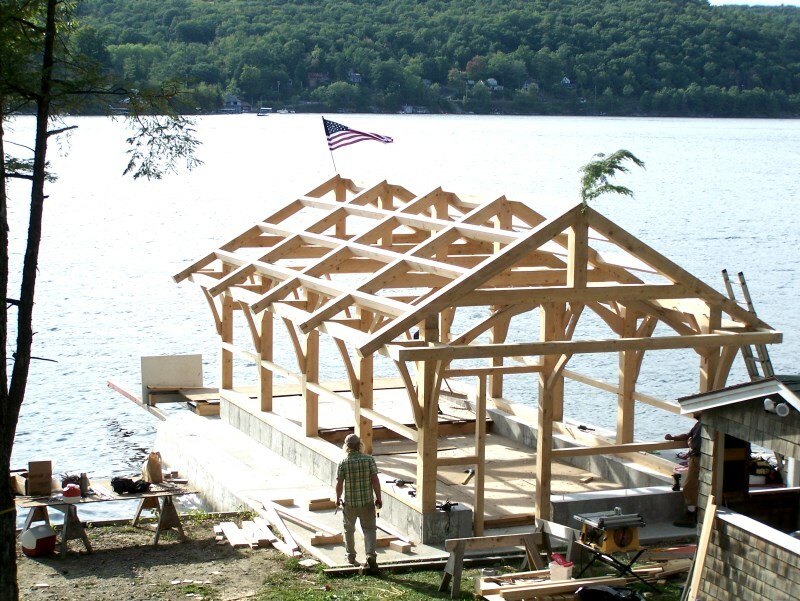 This entry was posted in Green Mountain Timber Frames, Luke Larson, Luke Larson Carpentry, new timber frames, Vermont and tagged boat house, carpentry, custom builders, custom building, Luke Larson, New Timber Frames, Post and Beam, post and beam construction, vermont builders, vermont construction by Green Mountain Timber Frames. Bookmark the permalink.